This week at PopMatters, I share some of my experiences with Demon's Souls' online components. First, a quick side note: the name, "Demon's Souls," is one of the most ungainly word pairings I've ever encountered. Say it out loud and you're tripping over the alliterative double "S" sound in the middle. Write it out and you find yourself staring quizzically at apostrophe placement. The game's name is as ridiculous as the game itself. Anyway, those who have been following the site for the past month know that I've been trying to beat Demon's Souls before they shut off the multiplayer servers on May 31. It's not looking too good: time constraints and the game's punishing difficulty have turned out to be formidable roadblocks. Still, I'm happy I started playing when I did, as the multiplayer components have turned out to be one of the most memorable portions of the game. 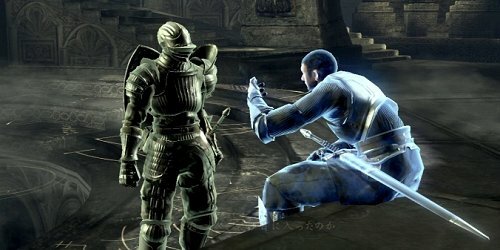 Demon's Souls can still be played as an off-line experience, but the subtle presence of other humans sets it apart from most other action RPGs. Whether it is stumbling across a sarcastic hint, seeing the ghostly demise of another adventurer, or forming short-lived alliances and rivalries, interacting with other people adds dynamism to a game that thrives on repetition. You'll play the same level a dozen times, but there's always a chance you'll see a new message or even be pulled into someone else's game. Closing down the servers won't be as damaging to Demon's Souls as it was for MMOs like Tabula Rasa or the The Matrix Online, but it still means that we'll be losing a significant aspect of the game. The online systems will disappear, taking their place in our memories alongside other digital artifacts like pre-Cataclysm World of Warcraft. It's times like this I wish I had a capture set up so I could more literally document the game for posterity. Alas, I was too late (and too lazy) to undertake such a project. Instead, I'll just contribute some qualitative evidence to the historical record by sharing some thoughts about the dark, dangerous, and hilarious experience of playing Demon's Souls online. You may be I treated to know that the server time in North America has been extended, owing to a renewed interest in the game.